Police say the man is a member of a problematic group of fans called the ‘Hugos’. Fans at the Champions League clash between Man City and Schalke. A MAN HAS been arrested in connection with the alleged assault that left a Manchester City fan in critical condition following their Champions League match against Schalke. 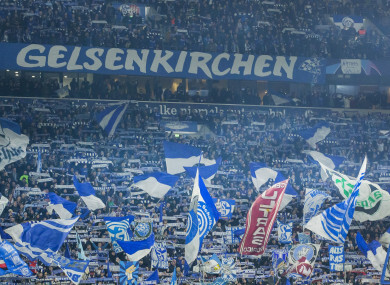 City appealed for information after the incident at Veltins Arena on 20 February, with some members of club staff remaining in Germany to support the fan’s family. Polizei Gelsenkirchen said the supporter had suffered a “massive traumatic brain injury” as they launched an investigation. And police in Germany have now made an arrest relating to the incident. A 30-year-old man from the city, who has not been named, was arrested on Monday morning in the Buer district and is now being held. Polizei Gelsenkirchen’s statement read: “The police arranged a homicide division to help investigate the case. Their extensive investigations directed to the contemporary identification of a suspect. City won the last-16 first leg 3-2 after late goals from former Schalke winger Leroy Sane and Raheem Sterling. Email “Man arrested after alleged assault leaves Manchester City fan in critical condition”. Feedback on “Man arrested after alleged assault leaves Manchester City fan in critical condition”.